If you’re playing The Division on PC, there are a few tweaks you can make to get the game running more smoothly. Or, if you’re getting a black screen at startup, to get the game running at all. First of all, that black startup screen: If that’s happening to you, you should be able to easily get around it by hitting Alt+Enter. That’ll bump the game into windowed mode, which should allow it to load. It’s not quite hitting caps lock to load your base in XCOM 2, but as immediate fixes to seemingly catastrophic problems go, it’s still a good one. I’m using an Nvidia graphics card and was initially having some trouble getting the game to go back into proper fullscreen mode after using the Alt+Enter trick. The solution I’ve found has been to disable the Uplay in-game overlay, which you can do in the Uplay settings menu. After doing that, the game would go back to true fullscreen, no problem. I’ve seen people in various forums saying that turning off the Uplay overlay also helped them resolve some stuttering and mouse input issues. 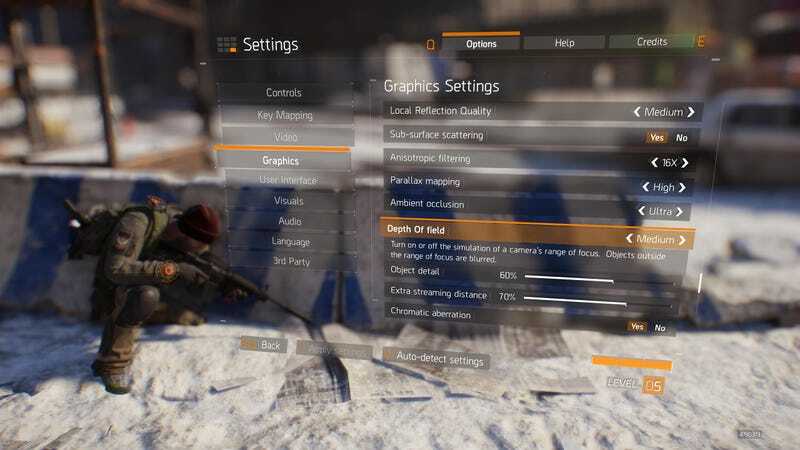 The Division has an impressive number of PC graphics options—there are expected settings like Antialiasing and Depth of Field, but also some more granular stuff like two separate settings for reflections and a whopping five for shadow quality. Nvidia has posted their usual big breakdown of all of the different settings, with helpful graphs that indicate which ones you can lower to get the biggest performance gains. If you’ve got any other tips for how to get the most out of the PC version, I hope you’ll share them below.